The 12% grade on my Garmin tells me that we are no longer in Indiana. 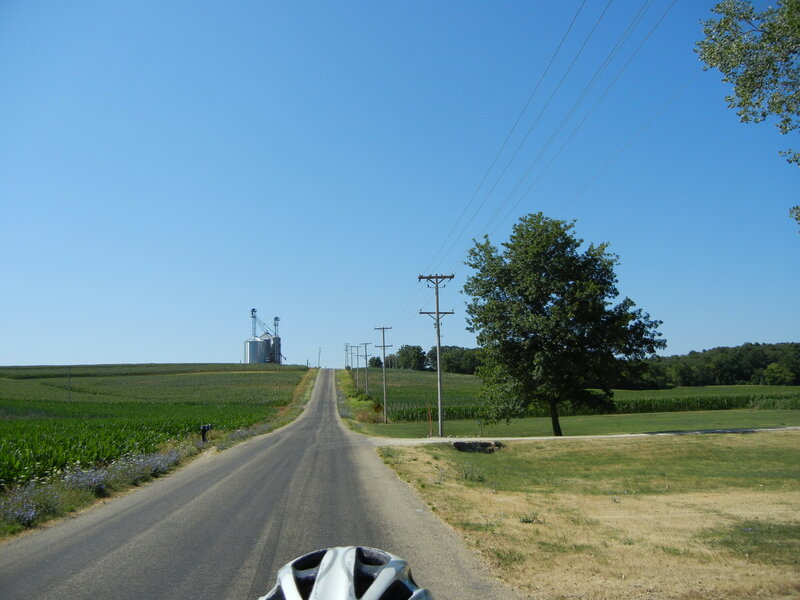 We have left the flatland behind for the hills of south-central Wisconsin. After a couple of miles of Middleton traffic, we are back in the car-free, rolling rural roads. The roller coaster hills of Wisconsin. The roads here are very wide, so even if there is a car, there is plenty of room for everyone on the road. After climbing a bit to start, we wind up in a big, corn-filled valley, which they call a dell in Wisconsin. High-ho the dairy-oh! We see some dairy cows too, and they look “udderly” glad to see us! 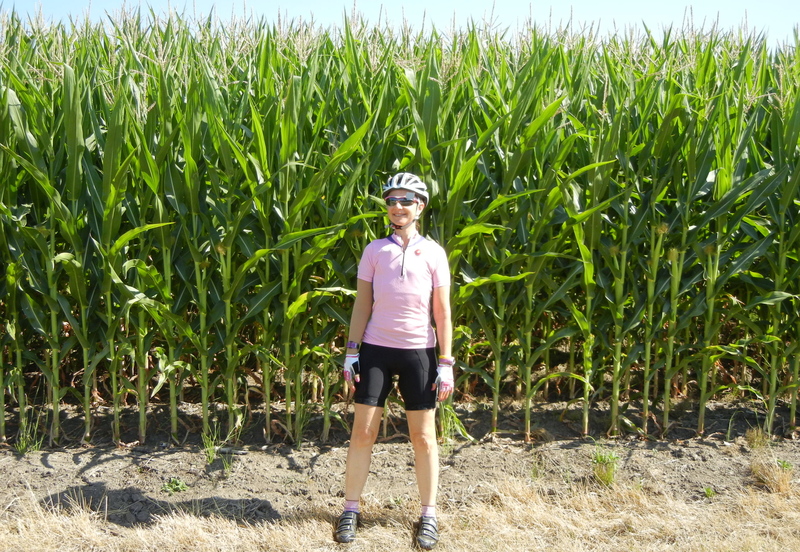 The locals say that it’s not a good year for the corn. It looks tall to us. 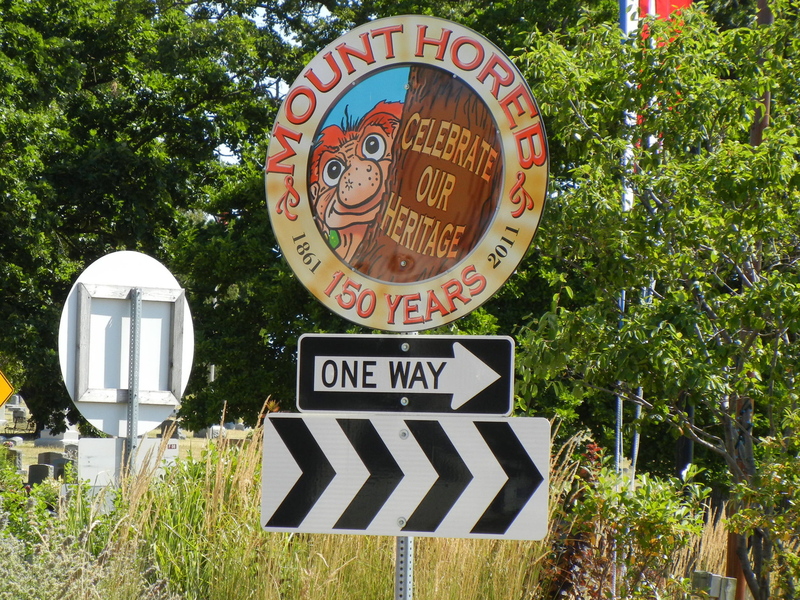 Our destination is Mt. Horeb, which used to be the mustard capital of the world, but is now the troll headquarters of this area. They are into their trolls in Mt. Horeb. Like many towns in this part of the state, there is a bakery and a brewery here. 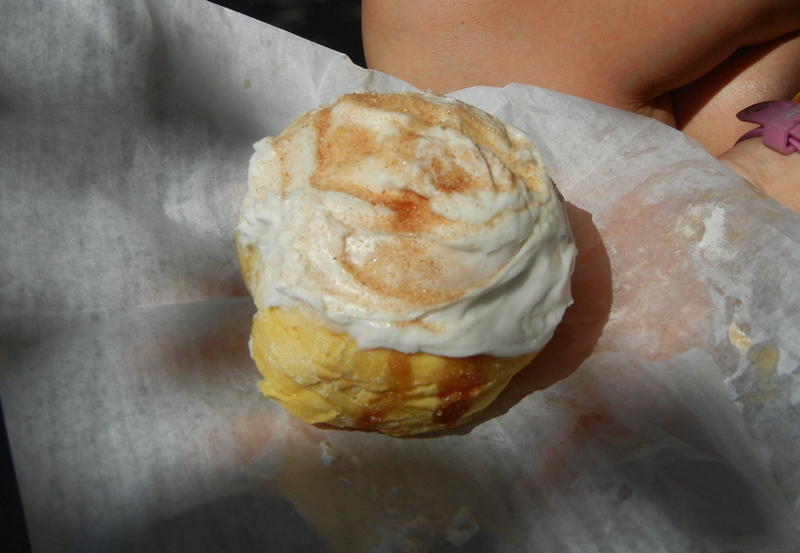 Since we are riding, we only visit the bakery, and because we can’t choose between two treats, we get them both. Cinnamon bun with frosting. 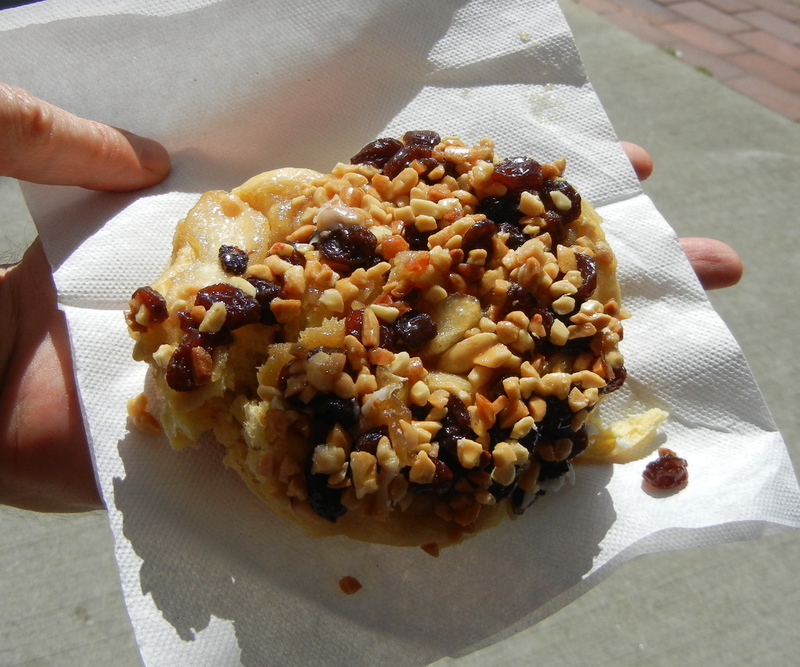 The perfect bike snack? The lady behind the counter “made” us get this one. We’ll be back in Mt. Horeb to start a ride on Friday, so we’ll give you a brewery tour in a later post. The road is closed on our planned route, so we get on the Military Ridge bike trail to head back to the east. It’s a crushed limestone path, so it isn’t paved. By the time we get off of it 10 miles later, the bike is filthy, but we have the trail to ourselves, so there is no traffic at all. They charge you $4 to ride on the trail. We buy one pass for two people because we can’t figure out if that’s per person or per bike. The guy who sells us the pass can’t figure it out either, so he only charges us for the bike. 43 miles later, we enjoy a nice lunch at Middleton’s Hubbard Avenue Diner, which is famous for their pies. 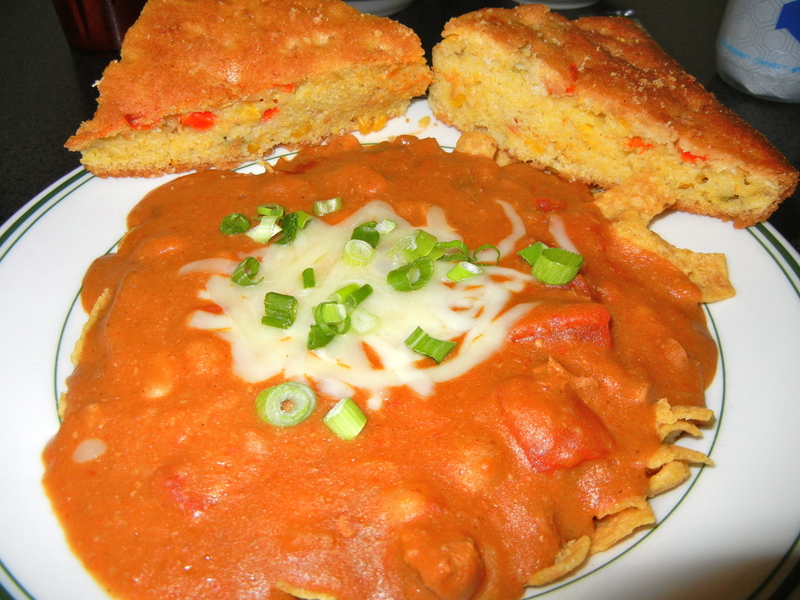 Chicken chili, frito style. I don’t eat this at home! 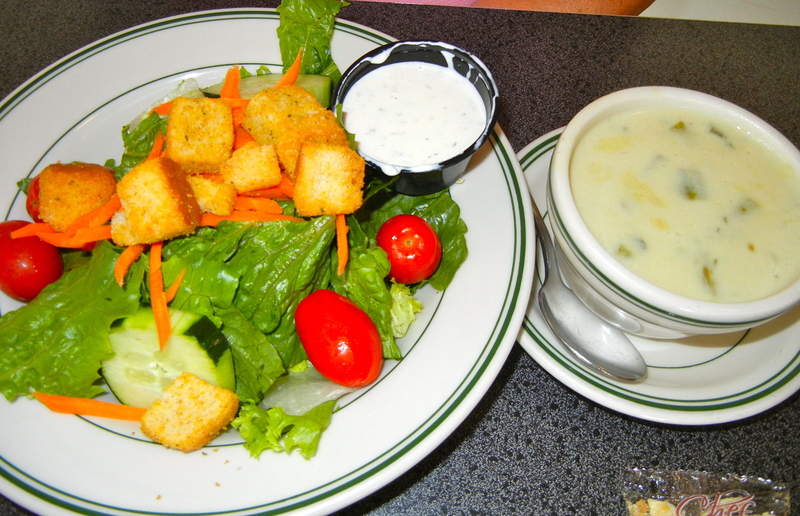 Chicken asparagus soup with side salad. Eve eats sensible. 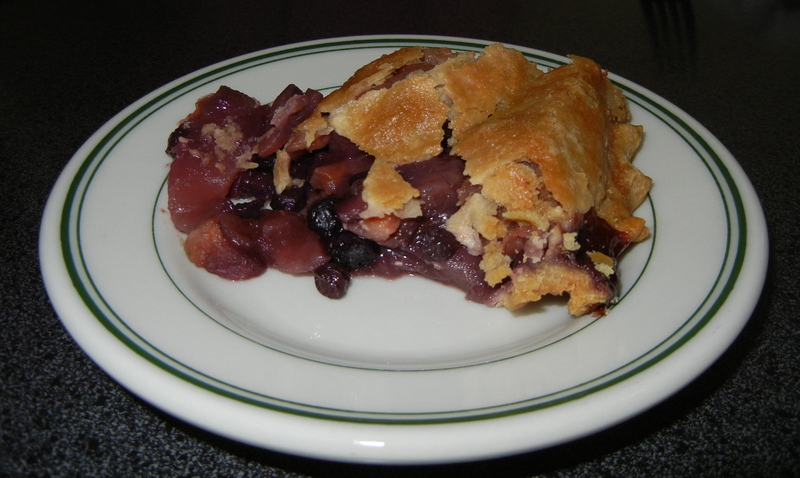 After lunch, we must have the pie, and it’s good. Everybody loves pie. Especially apple-blueberry. After lunch, we walk around the old town of Middleton. 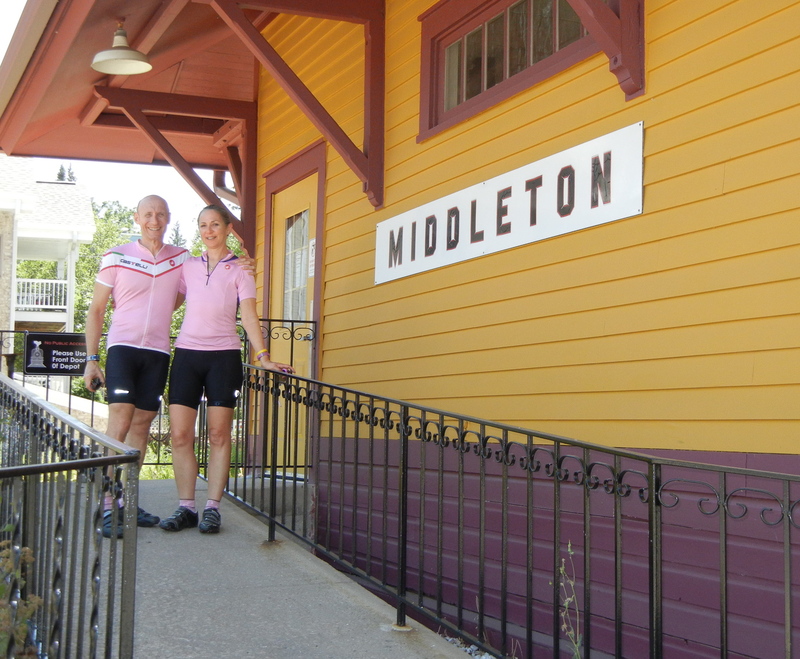 Greetings from the old train station in Middleton. 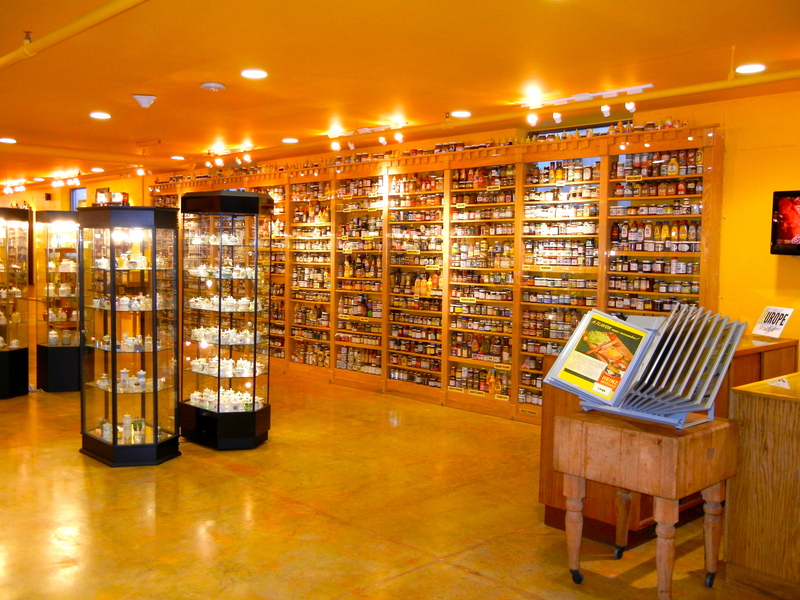 It seems the National Mustard Museum has moved from Mt. Horeb to right down the street from our hotel in Middleton. Isn’t that exciting? 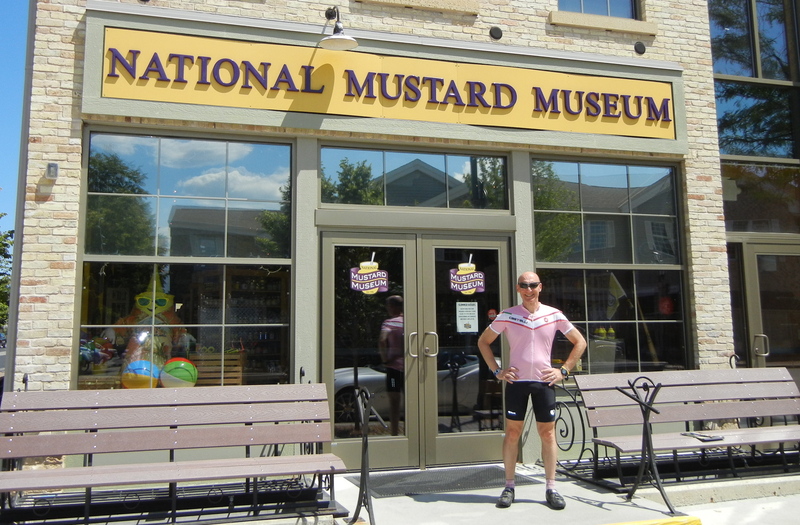 This photo proves that there really is a National Mustard Museum. You didn’t know this place existed? You do now! The inside of the museum, in case you never get there. As you know, we are in search of the best beer, cheese, and ice cream (and maybe now pretzels). 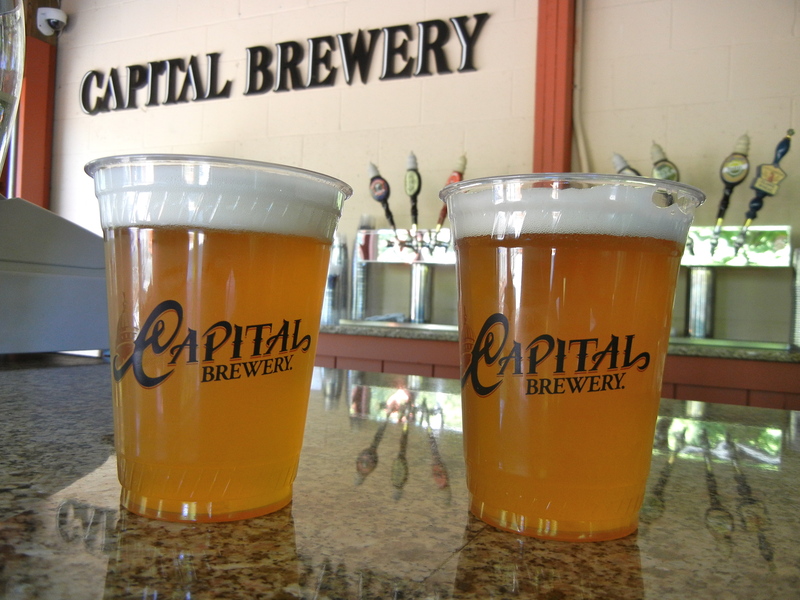 We have planned this part of the trip so that we are staying right across the street from the Capital Brewery, which someone voted the best brewery in America. We head over to find out if this is true. 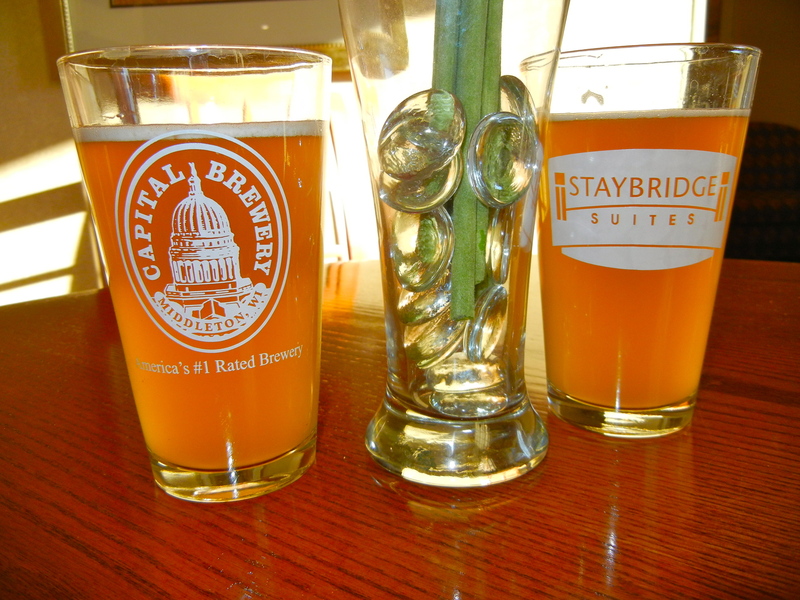 We had a blast at the Capital Brewery. Taken before our first beer–that’s why it’s in focus. The beer is great, and we meet some people on a tandem who have ridden their bike to the beer tasting. Luckily, we have walked, because one of the owners, Charlie, decides to buy us a beer, which we can’t turn down because that would be rude. We stumble across the street to our hotel and find that they have Capital on draft for their happy hour. We wouldn’t want to be rude and turn that down either, so we have one of those as well. And our hotel is serving the same beer. This is the weizen. We love this place! There are no pictures of our dinner because we never had it. Between the beer and the munchies at the hotel, we weren’t hungry enough for dinner.